Lock in a great price for nhow Berlin – rated 8.6 by recent guests! I loved the concept and design of the hotel. The details were well thought. Hotel is on great location, near to best clubs and restaurants. And free Seat sport car is great deal! The place where the hotel is, besides to Spree. The room. Great breakfast. Best treadmills I've ever seen in a hotel gym. Very clean. Fast check-in and very close to train station. The attention to detail, the cleanliness, the food was pretty good and most of the staff. nhow Berlin This rating is a reflection of how the property compares to the industry standard when it comes to price, facilities and services available. It's based on a self-evaluation by the property. Use this rating to help choose your stay! Europe's first music hotel, nhow Berlin is located directly on the banks of the river Spree and just a 5-minute walk from MTV Berlin and Universal Music. It offers 2 professional music recording studios, elegant spa facilities and free Wi-Fi. The air-conditioned, nonsmoking rooms at the 4-star nhow Berlin feature a flat-screen TV with a USB connection, a Nespresso machine, tea facilities and black-out curtains. Exclusive La Bottega toiletries are provided. The nhow's electric guitars can be borrowed at no extra charge. Free Wii consoles are located in the lobby. The nhow’s 2-level spa includes a modern gym, 2 saunas, and a relaxation zone. Creative German cuisine is served in the nhow Berlin’s brightly decorated Fabrics Restaurant. 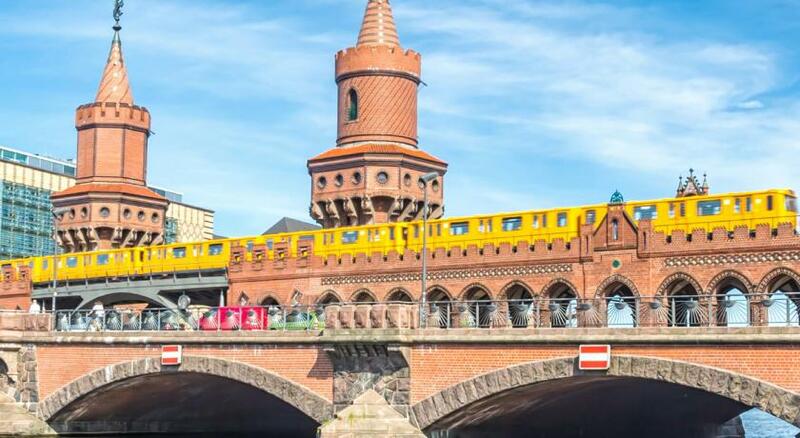 The large terrace overlooks the River Spree and also features a view of the Oberbaumbrücke. DJs perform at the envy Bar Thursday through Saturday, while guests can also enjoy a wide range of events on-site. Warschauer Straße S-Bahn and U-Bahn Train Station is 1,650 feet from the nhow. Alexanderplatz Square is only 3 stops away. Friedrichshain-Kreuzberg is a great choice for travelers interested in atmosphere, culture and convenient public transportation. When would you like to stay at nhow Berlin? This stylish and spacious air-conditioned junior suite features 2 flat-screen TVs, iPhone dock, a safe, mini-bar, wooden floorboards and a private bathroom with a bathtub, shower, toiletries, a hairdryer, bathrobes and slippers. This junior suite also offers extra space, a comfy sofa, free tea/coffee facilities and a stylish work desk. Some suites offer great sweeping views of the River Spree. Guests are also welcome to use a BMW Mini, a Gibson guitar and a Casio keyboard (available on request and subject to availability). Private parking is available on site (reservation is not needed) and costs EUR 16 per day. This stylish and spacious air-conditioned room features a TV, iPhone dock, a safe, mini-bar, wooden floorboards and a private bathroom with shower, hairdryer, toiletries and high-quality towels. This room also offers a separate seating area as well as a great view of the city. Other features in this room include a choice of pillows, tea and coffee facilities, a data port and a free wired internet connection. This stylish and spacious air-conditioned room features a TV, iPhone dock, a safe, mini-bar, wooden floorboards and a private bathroom with bathtub and integrated shower, a hairdryer, toiletries and high-quality towels. This room also offers a separate seating area, while some rooms also offer a great view of the city. Guests also enjoy free use of a BMW Mini (available on request and subject to availability). Other features in this room include a choice of pillows, tea making facilities, a Nespresso coffee machine, a data port and a free wired internet connection. This stylish and spacious air-conditioned room features a TV, iPhone dock, a safe, mini-bar, wooden floorboards and a private bathroom with shower, hairdryer, toiletries and high-quality towels. This room also offers a separate seating area. Other features in this room include a choice of pillows, tea and coffee facilities, a data port and a free wired internet connection. This room is stylish, more spacious and air-conditioned. It features a TV, iPhone dock, a safe, mini-bar, wooden floorboards and a private bathroom with shower, hairdryer, toiletries and high-quality towels. This room also offers a separate seating area. Other features in this room include a choice of pillows, tea and coffee facilities, a data port and a free wired internet connection. It offers a beautiful river view. This room is stylish, more spacious and air-conditioned. It features a TV, iPhone dock, a safe, mini-bar, wooden floorboards and a private bathroom with shower, hairdryer, toiletries and high-quality towels. This room also offers a separate seating area. Other features in this room include a choice of pillows, tea and coffee facilities, a data port and a free wired internet connection. It offers a beautiful river view. An additional bed can be provided upon request to fit 2 adults and one child up to 12 years. This room is stylish, more spacious and air-conditioned. It features a TV, iPhone dock, a safe, mini-bar, wooden floorboards and a private bathroom with shower, hairdryer, toiletries and high-quality towels. This room also offers a separate seating area. Other features in this room include a choice of pillows, tea and coffee facilities, a data port and a free wired internet connection. It offers a beautiful river view. An additional bed can be provided upon request to fit up to three adults. Europe’s first music and design hotel is located directly on the banks of the river Spree. Exceptional interior design awaits you in our rooms. Enjoy a spectacular view, extraordinary food at our restaurant or order a guitar or a DJ set to your room. Hotel surroundings – This neighborhood is a great choice for travelers interested in atmosphere, culture and convenient public transportation – Check location Great location - show map Guests loved walking around the neighborhood! House Rules nhow Berlin takes special requests – add in the next step! nhow Berlin accepts these cards and reserves the right to temporarily hold an amount prior to arrival. * Rooms are big, but the comfort level is not that high. I assume it's something to do with the interior and lightning, not very feng shui, but I feelt the room was a bit cheap. *House keeping was a disaster. Everything went wrong every day. (3 times) Wrong towels returned, Only 1 coffeemug when we were two persons, and later no paper cofee cup were given. So basically no possibility to drink any beverages. When we run out of toilet paper, it wasn't replaced the following morning. One time is accepted, but not 3 times. *The bar outside near the river, expensive but great. *The coolness of the hotel with all the different art and colours. *The location is good, but it all depends where you are going or prefer. You have the river next to the hotel, and a small walk to Kreuzberg or the other way to Friedrichshain. Both good places to visit. Airco. Very warm in the rooms. Room was very clean, nice facilities, bed was really comfy. Perfect location for us as well. I arrived on a Sunday afternoon and was surprised that the hotel restaurant is closed on Sundays. I couldn't reach the room service to order some food via phone and the reception couldn't help with the order either. In the end I had to go out to find something to eat. A very nice spacious room, very clean. The climate control in the room could be improved. The location is good. There is subway nearby, just walk 5-7 minutes. Also Rewe supermarket is near the subway, and some cafe and small restaurants. The hotel is very unique and beautiful, all in pink color with musical theme decoration. There is nice bar on the first floor. The room wasn’t so big but had all we needed. Beds are comfortable. Good bathroom. Cleaning was ok , once the cleaning lady left dirty towel inside the room. Breakfast selection fabulous. Comfortable bed. Groovy! Bathroom was old looking and there weren't any locked doors. Amazing hotel, the design is incredible and the breakfast is so perfect! I really loved it! The concept of the hotel is well played out. Breakfast was better than most. We tried to order room service at 1am put they only had one dish available from the menu. But the staff told us we can order via lieferando and they would gladly bring it up. Staff was overly friendly. Highly recommend this hotel. A very nice location close to the East side gallery, great facilities, comfy bed and excellent transport links to all the touristy/ non-touristy places. All this at a very reasonable price.